John Hassman is a Fortune 500 executive, 4-time IBM Champion for Analytics and a frequent industry speaker. As a Marketing Analytics executive, he has been leading teams and creating insights from data for nearly 20 years. Currently, John serves as Vice President of Analytics for CIT Group (NYSE: CIT) a Financial holding company with approximately $50B in assets and one of the largest banks in the United States. His responsibilities include growing the Analytics function, Customer Segmentation & Advanced Analytics. Prior to joining CIT, John was Director of Marketing Analytics & Data Science at Adtalem Education Group. His major contributions to Adtalem were the development and implementation of multi-touch marketing attribution and improving the student experience for the graduate business program. Before joining Adtalem, Hassman spent 7 years with Fortune 500 distribution company Essendant. During his tenure with Essendant, he created the Marketing Analytics function and held various roles of increasing responsibility in the areas of Marketing Analytics & Consumer Insights. 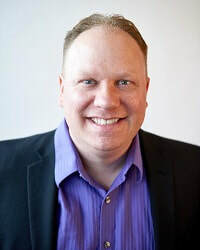 John has an Undergraduate degree in Marketing with an Economics Minor from the University of Wisconsin-Green Bay and an MBA from the Keller Graduate School of Management.